This has been sitting in the stack for several weeks now, just waiting for a little editing. Now that my hands are starting to recover from carpal tunnel syndrome, I am finally getting it out the door. With the sessile fruit (1b), the next choice is (5b): pod uniform, not divided crosswise into 2 segments (this threw a bit as I wasn't certain at first which direction they meant by crosswise, but the illustration made it clear enough). I find the illustrations in the key very useful, probably more useful than the glossary. The next choice was even easier: the fruit is a silique (long and thin) rather than a silicle (closer to round) (6b). It would be easy to get caught up in the difficult terminology in the next choice (and I did go through it when keying out initially), but we can simply note that our plant does not fit into the more easily understood criteria (e.g. petals are not 11-15 mm) so we make our choice (13b). The petal size is probably the most straightforward of the criteria, but the description included in the couplet "grayish with branched hairs; petals...pinkish to purple" and the habitat were also good clues that 13b was the correct choice. The next split is on whether the seeds are uniseriate or biseriate (a single series or a double series). This was a little confusing to me because the fruit has a series of seeds on each side - so there are two series of seeds, but each series is in a single line. The illustrated glossary that I use pictured biseriate as being two series in the same enclosure (e.g. a row of seeds attached to the top of the enclosure alternating with a row of seeds attached to the bottom - like a zipper). Based on that interpretation (that the fruit contained two sets of uniseriate seeds) I jumped to group VII. The comparison to a zipper seems particularly useful. The next choice (74b) was easy to make based on size of the petals and seeds, but I would like to point out the word torulose (just for fun). I kind of like connivent: converging or coming together, but not organically united. Siliques of this plant are dehiscent (75b) - another common name for the plant (probably the genus in general) is shotweed: when the plant dries, the little panels holding the seeds in will often spring back at a touch, shooting the seeds out like shot. Leaves are definitely not entire (77b). This one's a bit tricky: Pubescence (hair) simple or branched? With the size of the hairs on these plants this probably needs some magnification. With a fresh sample I might have been able to eyeball it, but a hand lens would definitely be in order. My microscope was handier today, and all the hairs I could see on my dried out sample were simple (78a). The hairs visible in the photo were not branched. The photo was quite useful for identification. Siliques much less than 5cm (79b). 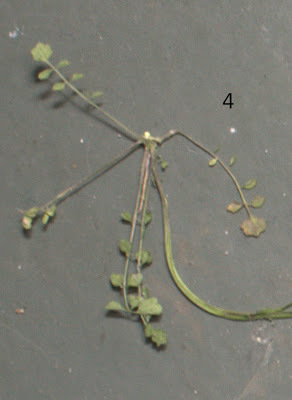 Stem leaves all pinnate (81a), (82b) which takes us to the genus Cardamine. I will leave determination of the species to the final part of this series. The species determination should be interesting. Setting: Sitka, Alaska middle of June last year. 1. What species do you see? This is a little late in coming. I've been busy getting my dandelion wine going. Hopefully I will get the next part for the answer to last week's question up soon too. Setting: Around my neighborhood in Kirkland last week. 1. What species of bird? 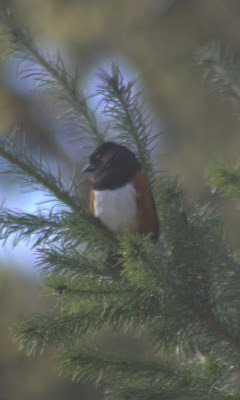 This is a spotted towhee (Pipilo maculatus) - a bird that likes to hang out under brush. Its song is a fast trill and often makes a call (around here anyway) that reminds me of a squeaky door. 2. 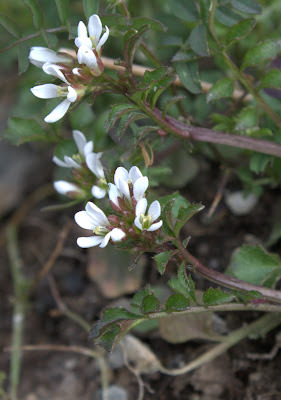 When in bloom, this plant is one of the showier natives of the Pacific Northwest. What species is it? 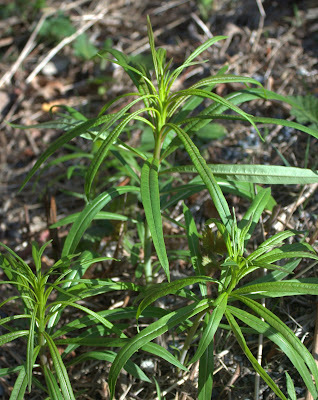 This is fireweed. 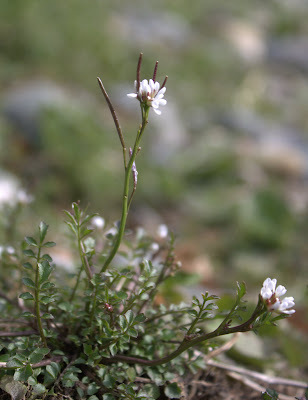 I learned its scientific name as (Epilobium angustifolium). Apparently its currently accepted scientific name is (Chamerion angustifolium) though (thanks Kitty). It has a pretty spike of pink flowers at the top when blooming. At this young stage, the leaves have a bit of a mustardy flavor when nibbled raw. The leaves can be made into a mild tea and the flowers are sometimes used for honey. After working on dandelion wine this past week I am interested in seeing how a fireweed wine might turn out. Hopefully I will remember to try when they start to bloom. On my recent Nature Quiz I asked about the identification of a plant that grows in my neighborhood. I was pretty confident about its genus already, but getting down to the species level can be a little tricky sometimes. I was planning on being a wimp and just giving the answer at the genus level that I was comfortable with, but Kitty's comment inspired me to go and try to key it out. I ran in to some trouble. Kitty kindly agreed to provide some analysis/commentary which is in italics throughout the post. I used Flora of the Pacific Northwest (Hitchcock & Cronquist) with a bit of help from Plant Identification Terminology An Illustrated Glossary (Harris & Harris). Rather than jump to the genus I believed it was, I started at the Cruciferae (mustard) family level. I had scanned ahead to see where I wanted to end up and this was taking me down the wrong fork. But what the heck, might as well follow what the plant and key tell me rather than my preconceived notions. I could clearly see a stalk supporting the fruit that was around half a centimeter long, so I chose 1a. 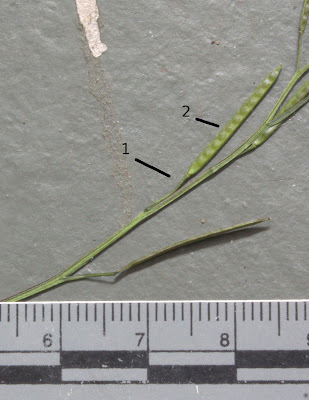 In this case stipitate refers to a stalk associated with the fruit, not the short stalk that connects the fruit to the main stem. If you look at the drawings in the H & C key, there is a clear join between the stalk subtending the fruit and the stalk that connects to the stem. I took 1b. Next branch was easy (2b), this plant has siliques (long and slender fruits) rather than silicles (more oval fruits). Then another easy choice (3b) since the flowers are white rather than yellow (see the quiz for photo with flowers). This is a nice illustration for a morality tale, one wrong turn... Then more trouble. The petals are clearly white, but the basal leaves are also definitely not hastate. There is not a lot of hair on the plant, but there is some. So neither fit exactly, but 4b seems to fit better which would take us to the genus Thelypodium. The plant is definitely hairy, and the leaves not hastate, definitely not purple though, this is a clue that things are not good. The first branch (1b) is easy because the stem leaves are petiolate (have a stalk), the next branch (5b) the plant is biennial (I believe), and I could go with often glabrous though I'm not sure what it means that the siliques are generally spreading to erect. That means I had a problem somewhere along the way. Not surprising since I'm still pretty sure I am right about which genus it is (and even confirmed my guess using the much simpler key in Plants of the Pacific Northwest Coast - though it doesn't even list Thelypodium as an option). After I got this written up I think I figured out the original problem for myself. In the glossary's illustration the stipe is between the receptacle and the fruiting part, rather than between the fruit and the stem as I had been thinking. On closer examination the fruit seems to be sitting directly on the receptacle (is sessile). I will continue from there in the next part of this series. Nice job figuring out the original problem. Ants Hibernating through the Floods? Tracking club was lovely today - the weather was nice, the birds were singing and there were more interesting track stations than we could fit into the morning. While I was wondering about looking for tracks that could become the tracking stations, I noticed numerous small ant holes. 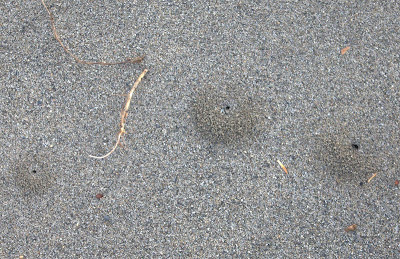 I've certainly seen ants out at the sand bar before, but hadn't really stopped to think about their seasons. I think they hibernate during the winter time. I didn't notice their presence during the colder months and it appears that they are just getting started with their year now. For a little while now some of us have been holding questions about what happens to small mammals during the winter floods. There are a number of places, like the tracking club sandbar, that get completely covered by the flood waters multiple times throughout the winter. There are deer mice, jumping mice (who also hibernate), shrews and moles in those areas. Do they climb vegetation, just die, move to higher land, swim, something else? If they die or move how long does it take to repopulate the area? For at least some of them it doesn't seem to take long for them to show up on the recently flooded landscape. While the water from one of the floods this winter was still receding we found numerous deer mouse tracks in the freshly deposited silk as well as a number of larger mammals. And I don't think it was too much longer before I noticed fresh mole activity. But mammals are relatively big and mobile compared to ants. It would be a real stretch to expect ants to move to higher ground, though not too much of one to think they might climb a tree. However, if they are hibernating underground, what protects them from flooding? Perhaps they have chambers that manage to trap enough air during the flood or maybe they don't need much air while hibernating? Maybe like some insects, they are able to keep an air bubble around them in the water? I did a little Internet searching on ants in floods and saw a lot of links about fire ants floating. There was also an abstract for an article about one species of ant that lived in bamboo and managed flood control by drinking water inside, then going outside and peeing. I didn't find anything about this sort of situation though. Setting: Late March 2009, alongside the road in a residential neighborhood of Kirkland. For scale, it was probably 3 or 4 inches tall. 1. What species of plant is this (or if not to species, how closely can you identify it)? This plant is in the mustard family Cruciferae, the four petals opposite each other is typical of mustards, the long slender fruit is also one of the typical mustard fruit types. The mustard family is diverse and often weedy around here, so it can be difficult to get down to a particular species, though the genus is not as difficult to determine. I decided to attempt to key out the plant to the species level and wrote up a new post for part 1 of that experience. 2. Is it edible? If so, what does it taste like? I am not aware of any poisonous mustards in this region (when eaten in moderate amounts). This one is definitely edible and has a peppery flavor characteristic of many mustards. As a side note, many of our cultivated vegetables are in the mustard family such as broccoli, cabbage, radishes, turnips and brussel sprouts. Setting: Last October, just east of Snoqualmie Pass. 1. What species of tree is this? This is a red alder (Alnus rubra). Note the bright color of the inner bark that gives it its scientific name. 2. What happened to it? The damage to the bark is typical of an ungulate rub. Because of the height on the tree (which is a little difficult to ascertain in this picture) I believe it was from an Elk (Cervus elaphus). 3. Approximately how old is the damage? The damage was fairly recent. 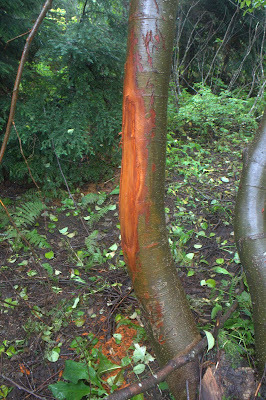 As the wound on the tree ages the color will dull significantly, also note the fresh bark that has fallen on top of the vegetation on the ground. There are several leaves on top of the fallen bark which suggests it probably hadn't occurred within the past few hours but it had definitely occurred that fall. I have not studied the relevant clues enough (e.g. how quickly the color dulls in the bark) to feel comfortable being too much more specific than that. But take a look at Dancingfrog's interesting analysis in the comments.